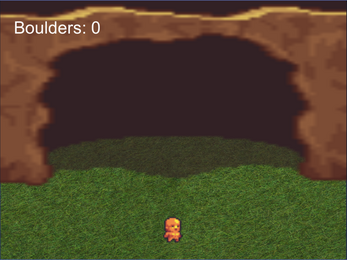 As the caveman "RockMan", you have just discovered a mystical cave. The cave takes anything that enters it, and randomly changes the size of it. Experiment with it the way cavemen do best... By using rocks! Use 'A' (left arrow key) to move left, and 'D' (right arrow key) to move right. When the cave throws out a rock smaller than you, touch it to throw it back into the cave. If the rock is larger than you, get out of the way! The game ends if you miss a small rock, or get crusheUpdated by a large boulder. Start Menu Music: "Snail's House - Pixel Dream"
Gameplay Music: "Snail's House - Ma Chouchoute"